Smart modular padlock that propose an extreme flexibility on applications and use cases. 53xLIDAR is a community made, completely solid state, LIDAR with open source hardware and software. B4 is a Robot based on ROS, uses a Microsft Kinect to map the environment, interacts with external sensors. Autonomous monitoring system of a cluster of lead-acid batteries. Acquisistion and transmission of Voltage + Temperature + Resistance values for every element. 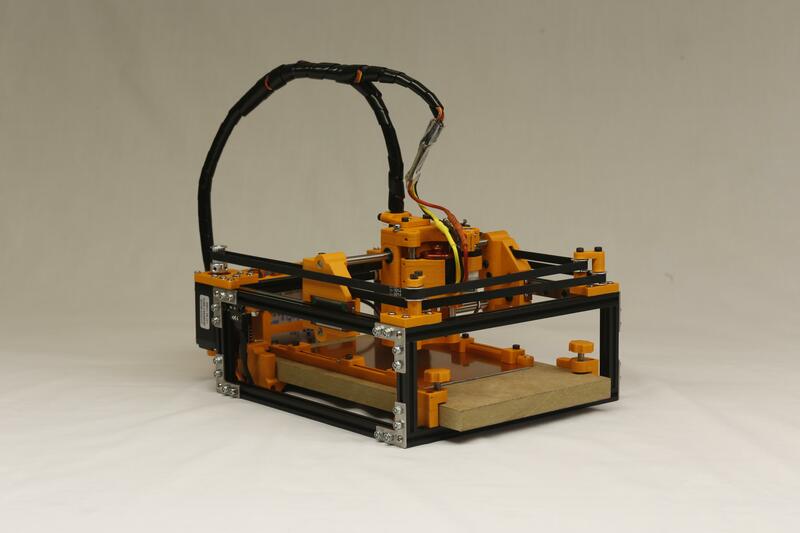 Ciclone2 is a 3d printer with 2 x axes X moving in opposite directions. This particularity allows to have a double printing volume. A smart Alarm Clock: it connetcs to internet and to local sensors to get info on trains, weather and whatever you need to know when you weak up in the morning. A compact and affordable CNC. An open project for makers who want to make their circuits free from chemical processing. Let’s recycle the internet we waste into a distributed & encrypted cloud that is forever-free for the users! DressCoders is an innovative startup aimed at the production of technological clothing, especially through the use of LEDs, optic fibers and microcontrollers. How to measure the instantaneous power absorbed by the electrical system and send it to a display and sound a buzzer if max power is reached. Based on Arduino. Engrave Cube (E³) is the portable and stand-alone device designed by "Fablab Napoli" to make laser engraving simple and safe. The open 3D co-design and digital fabrication platform you were looking for. ERWHI is a small robot that learn environments and interact with objects. Filament extruder for 3D printers 100% recycled through the use of plastic bottles. Fab Academy is an international course, held by MIT professor Neil Gershenfeld, that teaches how to use digital fabrication technologies and what you can do in a Fab Lab. Fashion Design, Healt & Wellness, 3D Printing for social and archeology are the issueses of Fab Lab Frosinone 2018's main works. Teaching and design products for teaching various disciplines, from storytelling to mathematics, from physics to history, from design to art, paths that in addition to teaching content develop creative skills, design, problem solving, leading to the rediscovery of dexterity.. The silk production chain: innovation and technology in order to make silk thread for hand craft items made in Italy. The drone can provide an initial response in the event of a medical emergency, quickly bringing the most appropriate equipment to the situation, especially when every second counts. Fishing in an easy way! today you can with the help of a drone, bring the bait to the desired point with maximum precision thanks to the fishing drone! School of Physics 4.0 with Arduino and Smartphone, promoted by the Physics Department of Sapienza within the Scienti fi c Degree Plan, and held at the FabLab InnovationGym of the Fondazione Mondo Digitale. Three days dedicated to digital programming and manufacturing. The course is aimed at the realization of kits able to perform and demonstrate physics experiments, as well as bringing the teachers closer to programming and rapid prototyping. Every year in September there is the course that will give birth to several artifacts, this year we have the pleasure of organizing this initiative, sure that this edition will also produce interesting objects. FLOW easy thermoforming presents FLOW A3desk the compact and professional vacuum forming for everyone. With a unique device: payments, identity documents and subscriptions have never been so simple. The Fondazione Mondo Digitale (FMD) is committed to the creation of an inclusive learning society in which innovation, instruction, inclusion and fundamental values are all combined to work together. Geduino is an open source platform designed for Autonomous Robot application: the goal of Geduino project is to build a robot able to act autonomously in a real human environment. Electronic boards to be assembled, equipped with schematics, components and instructions so that users can have fun while learning electronics. open loop gimbal powered by satistical error predicion. "HELFY" (HELp For You) is the bracelet that sends requests for help for the elderly in difficulty at home. Equipped with a big button, once pressed sends help requests through WiFi to relatives, both in form of email and phone calls. Relatives, once alerted, can watch what is happening through the associated video surveillance system. Our glasses made with hemp bioplastics, in a Steampunk optics allow us to think about what would have been the past if the use of bioplastics had been established before! The glasses are made of 95% biodegradable materials, with plywood parts. Control solutions based on IoT and AI technology for climate control and energy optimization of buildings. The Turnantenna will change Wireless Mesh networking forever. It's powerful, it's clever, and it's open source!